The screenshot below shows 3 sub-windows. The lower one has two tabs, domterm-2 and domterm-3. The latter has focus (indicated by the magenta border), and is running the mc file manager. The upper left pane (domterm-1) shows how to embed html from the shell. The domterm-4 pane shows using Kawa to create composable picture values which are displayed using embedded SVG. You can resize panes by dragging the separator between them, and you can re-arrange panes or tabs by dragging a title bar. The screenshot shows as we are dragging the splitter between the two upper panes; the blue rectangles temporarily display the resulting sizes. 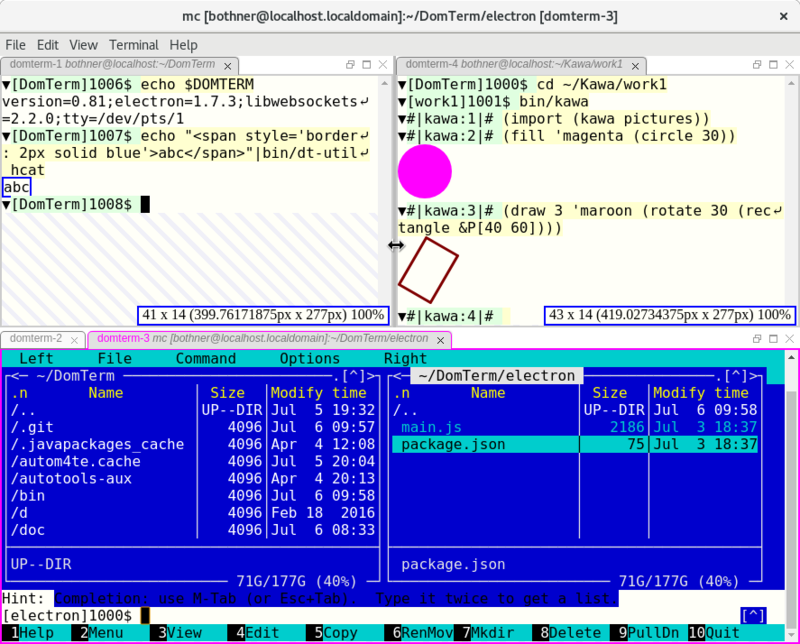 Compared to GNU screen or tmux, DomTerm supports more flexible layouts and easier manipulation using either mouse or keyboard. However, DomTerm does not yet support sessions that can be detached or accessed by multiple users at once, though I do hope to add it. Until then, I suggest using abduco or dtach to handle session management. Created 5 Jul 2017 20:46 PDT. Last edited 6 Jul 2017 10:18 PDT.